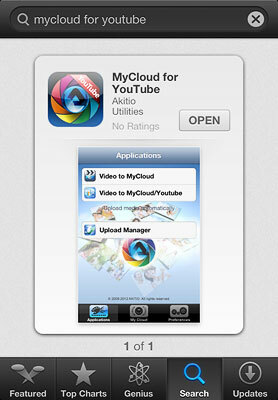 To download the app, go to the Apple App Store at https://itunes.apple.com/app/id570133170?mt=8 or search for mycloud for youtube. 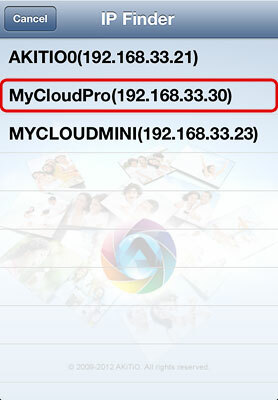 My device Enter the IP address, the MAC address or the device name that you have registered for your network drive. Enter the device name of your network drive, the MAC address or the IP address. 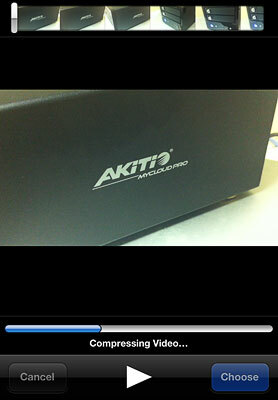 Video to MyCloud Upload videos from your album on the mobile device to your NAS. 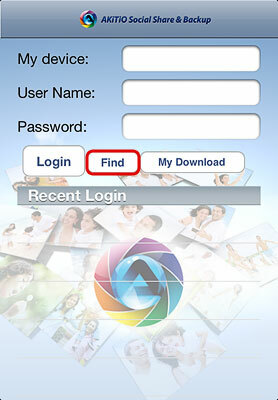 Click on Video to MyCloud, locate the video that you would like to upload, select it and click on Choose to upload the file to your NAS. 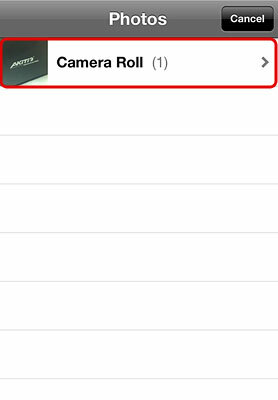 Video to MyCloud/Youtube Upload videos from your album on the mobile device to your NAS and simultaneously post them on YouTube. 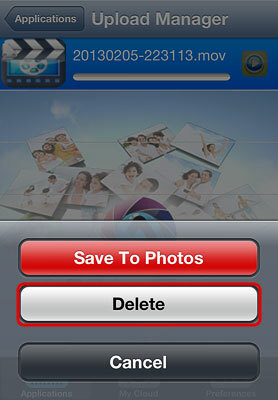 Click on Video to MyCloud/Youtube, locate the video that you would like to upload, select it and click on Choose to upload the file to your NAS. 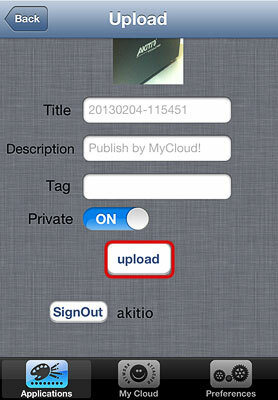 Follow to upload wizard to sign in to YouTube and post the video clip on your YouTube account at the same time. 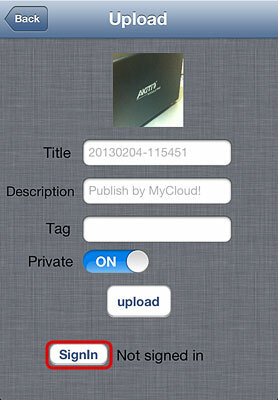 Click on Video to MyCloud. 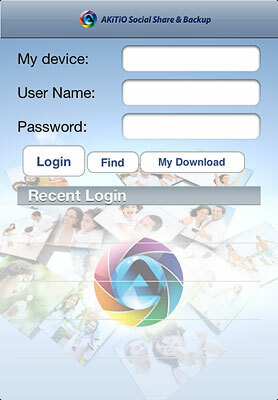 Click on Video to MyCloud/Youtube. 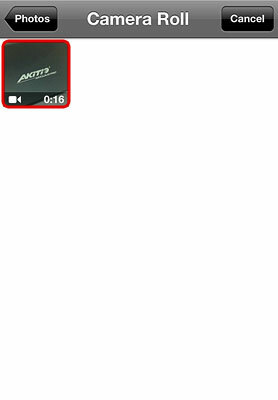 To post the video on your YouTube account, click SignIn. 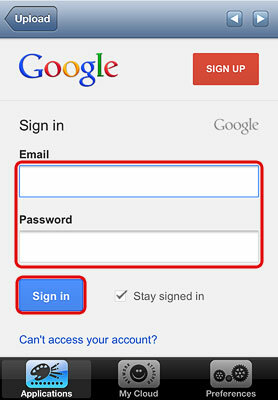 Enter your email and password for the YouTube account and click Sign in. Edit the title and the description or use the default values and then click upload to post the clip on YouTube. Wait for the upload process to complete. 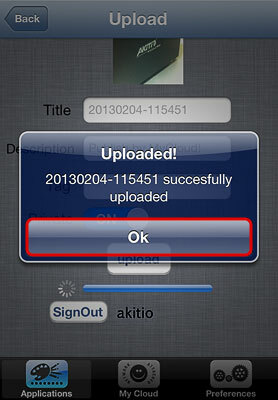 When completed, click OK to close the confirmation and finish the upload wizard. For a more advanced file explorer with file sorting and download function for offline viewing, please use the Akitio MyCloud app instead. 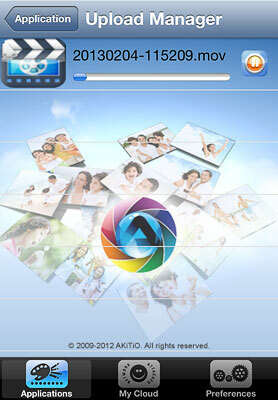 Play Each Slide For Time interval for the image slideshow.